Wildflower Wednesday: May I express my gratitude? I'm writing today to express my thanks to you for coming up with this wonderful meme called Wildflower Wednesday. 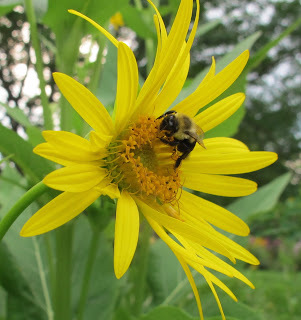 Through your garden, which we've all come to enjoy through your blog posts on Clay and Limestone, we've learned so much about the importance of planting wildflowers to attract pollinators. I thought of you when my garden designer sat down with me a few years ago and pointed to a newly proposed flower border in her design and suggested I could either plant it with day lilies or make it a prairie-type garden. Prairie-type garden, was of course my answer. I could envision it planted with wildflowers of different sorts, all blooming more or less toward the second half of the summer. Now after several years, I am thrilled with my choice. Mixed in with grasses, primarily Little Bluestem, Schizachyrium scoparium, I've planted mostly prairie type wildflowers including Cup Flower, Black-eyed Susan, Tall Phlox, Joe Pye Weed, Boltonia, Goldenrods, Asters, Culver's Root, and Liatris, to name a few. Did I mention I was thrilled with my choice? I did, didn't I! Well, it bears repeating, I could not be happier with this garden border filled with native wildflowers. If we are fortunate and watchful, occasionally people cross our paths and teach us through their examples. Gail, you are one of those individuals! I am grateful everyday that you have crossed my path, virtually visited my garden, and allowed me to virtually visit your garden. I am grateful for your inspiration as you ever so gently show us through your blog posts how wonderful wildflowers are in the garden. Oh sure, I still have many non-native, highly cultivated flowers and plants in my garden, but in my little prairie garden, I try to plant only native wildflowers. It has turned into a marvelous garden, which I call August Dreams Garden, and it is filled with pollinators. Thank you for all you've done to promote gardening with wildflowers and gardening to attract pollinators. You've helped make my garden better. P.S. - Some pics around August Dreams Garden just as it is approaching its peak bloom season. Wonderful! I love my Joe Pye Weed, Liatris,and Black eyed Susans. I am lookig forward to the goldenrod. What a wonderful post. I too love wild/native flowers and try to incorporate them into the garden. I love my Veronicastrum. right now it is loaded with bees, they love love love it.. I enjoy reading your blogs, keep writing. Lovely...I'm really enjoying my pink coneflowers this year as the deer have eaten more of them than ever.....last year I had a huge planting of them, now just a few here & there. Yes, the polinators are always welcome in our garden, as are butterflies! So funny you should post this right now! Just this week I was deadheading a small patch of cosmos I'd planted as a filler for an area I had not decided which perennials to plant and lo and behold I'm loving it so much I've decided to totally make it my "wildflower" garden next spring by adding more varieties of natives to my area. It was absolutely surreal to be sitting out there among the delicate flowers while butterflies landed right next to me and fluttered around. Can't wait to see what next summer will bring! What a truly lovely post! Thanks to both of you for your wonderful blogs!